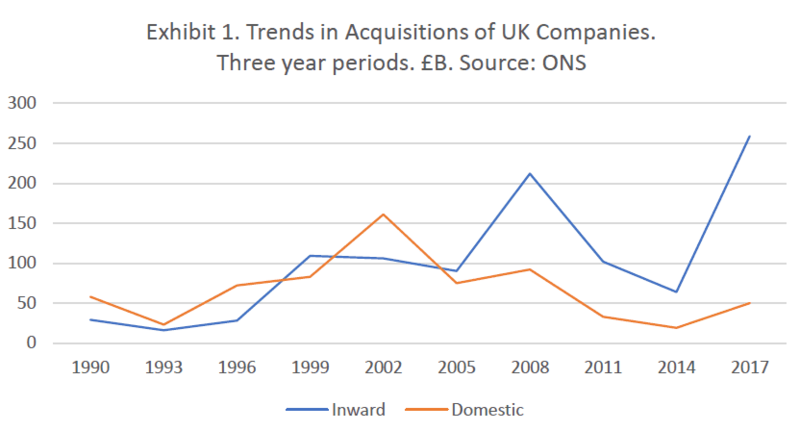 A destructively high level of takeover activity has characterised UK manufacturing for many years, both ‘domestic’ acquisitions by UK companies, predominantly quoted or private equity, and ‘inward’ acquisitions by foreign companies. Exhibit 1 shows the longer-term trends in all sectors; domestic deals by value peaked early in the millennium, but inward ones continued to grow strongly – in the last 3 years the inward value was four times that of domestic. This frenetic takeover activity is part of our fundamental problem of short-termism, making it much harder for us to grow national champions, or to develop the substantial Mittelstand-style family owned businesses that have done so much for German industry and society; focused generic growth has proven a much more reliable route to the creation of lasting economic value and good jobs than acquisitions. Exhibit 2 shows the extent of recent acquisition activity in more detail. 2016 was the all-time record for deal value, the vast majority inward, with our leading high technology company ARM being snapped up by a heavily indebted Japanese conglomerate, Softbank, with only meaningless constraints imposed by the government – such as the registered office remaining in Cambridge. There were some other unusually big deals in 2016, notably the acquisition of Londonquoted brewer SABMiller by Belgian InBev, but 2017 saw activity return to more normal levels. In 2018 activity has continued at typical levels, though with four manufacturing deals of over £100m. By far the largest was the hostile takeover of engineering behemoth GKN by serial acquirer Melrose, technically a domestic deal, but Melrose’s intention is to break up the group and sell each part to the highest bidder, so it is virtually certain that much of it will end up in foreign ownership. Ultra short-termist hedge funds played the decisive role in determining the outcome of this bid, just as they had in Cadbury’s takeover by Kraft, and once again the government’s strictures were ineffective. The other notable 2018 takeover of a quoted UK manufacturer was that of long-established engineer Fenner, which I used to run, by Michelin of France; at least in this case the new owner’s intentions are benign and there are some clear synergies, but even so I find it sad to see it go. The other two 2018 manufacturing deals over £100m were both disposals by family owned companies. William Jackson sold Aunt Bessie, an entrepreneurial subsidiary that had achieved impressive growth as a purveyor of Yorkshire puddings, to American group Nomad Foods, and Tithebarn sold Probiotics, a producer of animal health products, to Archer Daniels Midland, also of the USA. As private companies they are not obliged to disclose their reasons for sale, but one may wonder if Mittelstand businesses would have done the same? While takeover activity in 2018 has been broadly typical, the most recent quarter for which data is available (Q3) is the lowest for 4 years, but one cannot read much into this – acquisition activity is extremely lumpy, there can be a time lag of years between initiation and completion, and the state of global markets plays a major role too. It is hard to believe that the uncertainties of Brexit will not weigh on activity, but its effect may be yet to come; perhaps offsetting this, the decline in sterling precipitated by Brexit has rendered UK companies tempting targets for overseas acquirers. Looking ahead, nothing has been done to curtail the power of the hedge funds, the conditions imposed by the government in both the ARM and GKN deals provided no disincentive, and while there has been talk of subjecting takeovers to greater public interest scrutiny nothing has actually happened, so our short-termist ‘pursuit of shareholder value’ continues. 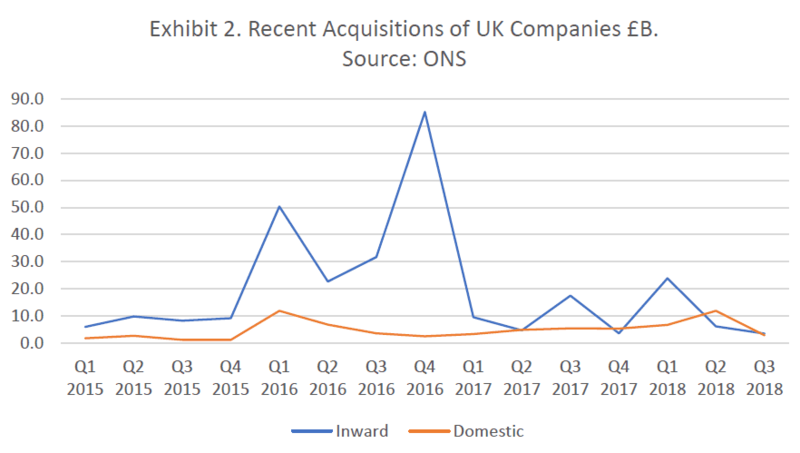 UK quoted companies continue to be more vulnerable to predators than those of almost any other developed economy, while private companies evidently remain willing sellers – even of successful businesses. In my book ‘Tragedy & Challenge’ I make many proposals for addressing these chronic problems. Tom Brown is the author of ‘Tragedy & Challenge, an Inside View of UK Engineering’s Decline and the Challenge of the Brexit Economy’, published by Troubador. ‘THE PRIME MINISTER SHOULD READ THIS BOOK.’ – Anthony Hilton, London Evening Standard. Having worked in engineering for 45 years in the UK and overseas, progressing from night shift manager to chairing 15 companies – ranging from stock market quoted, through private equity backed, to university spin offs – Tom Brown offers a unique insight into the challenges facing engineering companies post-Brexit, as well as the impact engineering has on the economy, on our exports, on people’s working lives, and on society as a whole. 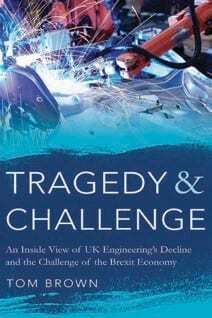 Tragedy & Challenge analyses the causes of the decline in UK engineering, considering its poor leadership, the detrimental effects of government economic policy, and the destructive influence of the City including an insider’s view of fund managers, analysts, and private equity. Tom also studies some of our most successful engineering companies, and concludes that while some decline was inevitable due to global factors, the example of Germany shows it did not need to be nearly so precipitate; some responsibility lies with management and unions, but ultimately poor governments, the short-termist City, and decaying social attitudes were to blame, and now Brexit makes the prognosis even more daunting. The book concludes with many positive proposals to address these problems, which are now attracting the attention of leading politicians.